Winemaker’s Notes: Gnarly Head 2012 Cabrenet Sauvignon is King – big, gallang, and powerful. This dark, bold Cabernet has solid tannins and jammy fruit, with aromas of black cherry, blackberry, freshly-cracked black peppercorn, violet, and charred notes. On the palate, flavors of dense black fruit compote and currant followed by a trio of clove, spice, and earth, lead to a generous, lingering finish. Try pairing this Cabernet with grilled lamb skewers, strong cheeses, or a spaghetti bolognese. 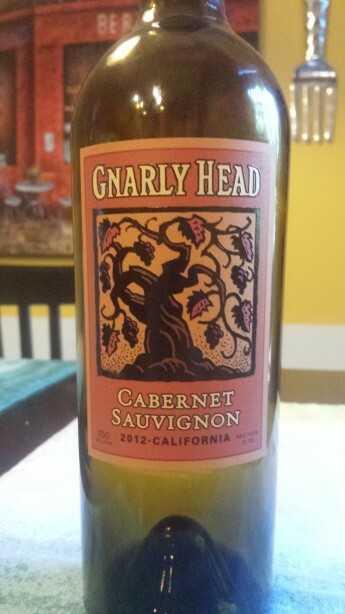 My Review: When I think of Gnarly Head, like most people I’m sure, I think of Zinfandel. I know in my mind that they make other things, but before this, had I been at the store and decided I wanted some affordable Zinfandel, Gnarly Head would have been near the top of my list. Cabernet may have joined it. I was really impressed by this wine. It went well with our dinner, it was enjoyable by itself, and it managed to avoid all the pit-falls that I usually associate with budget California Cabernet. On the nose I picked up jammy fruit with some black cherry. In the mouth, the wine was smooth, with currant, clove, spice, and earth notes jumping out at me, with almost a hint of chocolate as the wine opened up. Paired with a 4th of July dinner that included burgers topped with cheddar cheese and bacon, the wine did well with the grilled meat, but was eminently sippable all on its own. This bottle had been sitting in a new wine fridge at my house, and the slight chill on it is definitely something I’d recommend to anybody grabbing this bottle – not cold mind you, but definitely not just at room temperature. Around 62 should be perfect, especially this time of year in the heat of summer. For the price, it’s definitely one I’m adding to my list of budget red wines to enjoy this summer, and one I’d recommend for anybody looking for a red to share with friends that won’t hurt the wallet, but still manages to have a little character.